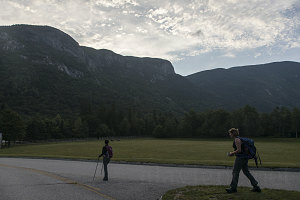 Anyhow, the last weekend of August rolled around and we were back in the Franconia Notch area again. I wanted to do something good, but also cover some new ground. 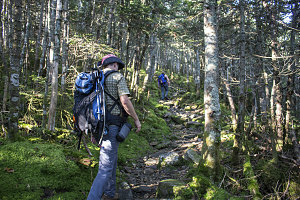 Examining a map of the area, it occurred to me that it might be nice to do a loop up and over Mt Lafayette, but instead of doing the usual thing, and incorporating the well-known Franconia Ridge section from Liberty to Lafayette, we could do a loop that went over the top of Lafayette and north. 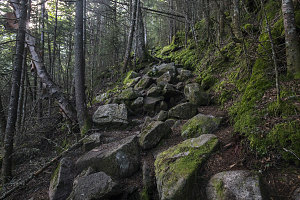 We would start and end at Lafayette Campground, and go up the Bridle path to the Greenleaf hut, up and over the top of Lafayette, continue north to the Skookumchuck trail, and take that back down to the notch. 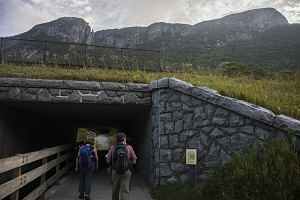 Then we could follow the multi-use recreational path that runs through Franconia Notch State park to get us back to the Lafayette campground. Not conventional, and certainly a bit awkward and not straightforward, but it was different - and probably not often done. 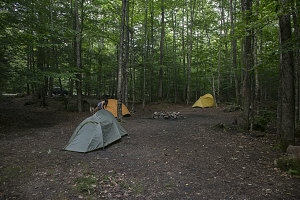 We decided to camp the night before in the vicinity, so that we could get a nice and early start the next morning. Our "different" loop involved some somewhat unclear bits where we would be linking up different trails, so I wanted time to figure that kind of stuff out. It was a busy Saturday afternoon at the Lafayette campground, and all of the 7 first-come/first-serve sites had been taken. 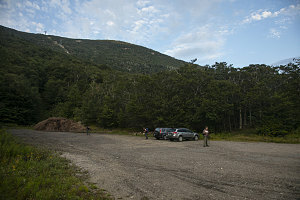 We then drove south of the notch and checked for sites at the Russell Pond Campground, but... no luck. 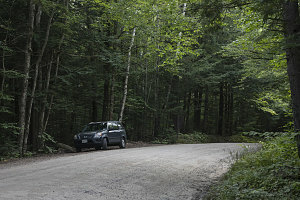 Time for our number 3 backup option - at-large camping along nearby Tripoli road - a gravelled backway in the White Mountain National Forest. I had camped along here several times in the past, and I felt sure there would be something. Turns out that Tripoli Road camping is now a pay-for-use area managed by custodians, who situated themselves roadside not far in from I-93. The cost was $20, not that bad I suppose, but more importantly, there were lots of open spots. So... accommodation search over! After a dinner in nearby Lincoln and an early to-bed at our simple campsite, we awoke in the pre-dawn hours to drive the twenty minutes or so back north to the Lafayette campground, our intended starting point. 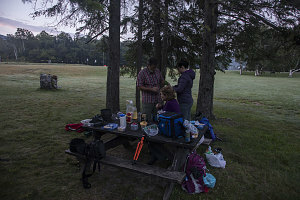 Here we had a quick breakfast and did the final prep to start our hike. As I was reviewing the itinerary, it occurred to me that it would be even more optimal if we chose to ascend the Greenleaf trail instead of our planned Bridle Path trail. 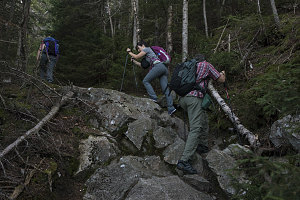 This would minimize the amount of distance we'd have to cover on the recreational path in the notch and it would also introduce us to a section of trail none of us had ever hiked before. 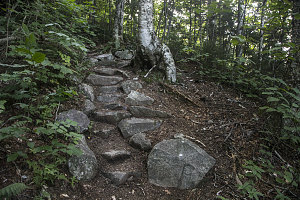 (New trail + Less distance) seemed very agreeable to the others, so we went with this last-minute alteration to our plans (oh, I forgot to introduce them... today we were four: myself, Jenn, Brian, and Sophie). 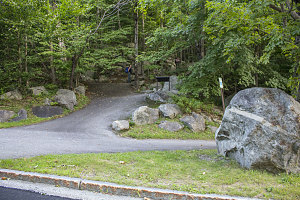 As far as I could tell, the lower start of the Greenleaf Trail was near the Cannon Mountain ski area, so we drove north for a few minutes (up I-93) and parked in the Kinsman Ridge trailhead parking area, near the ski resort's parking lot. Shortly after 6:30 a.m., we started walking. 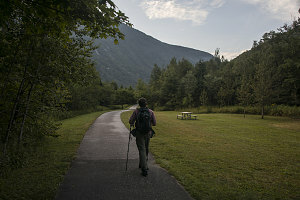 I had not seen any trailhead signs for the Greenleaf trail, and my maps weren't all that clear, so I decided to start walking south along the Franconia Notch multi-use recreational path until (a) we found the trailhead, or (b) we found some way to work our way up to roughly where it was. 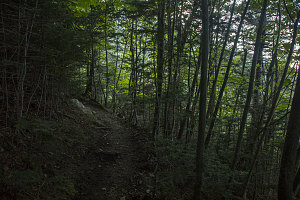 In the worst case, we could always follow the recreational path down to the Lafayette campground and take the Bridle Path route we had originally planned to use. The multi-use path is really like a wide flat sidewalk - smooth, well-maintained. Often with nicely manicured grass and open spaces on either side. We followed it as it ran underneath I-93 and then turned south, soon emerging from the forest at one of the park road's pullouts. 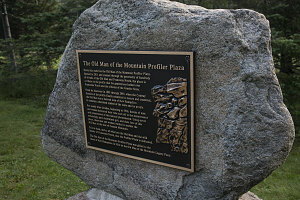 Here there was a small lookout area for the "Old Man in the Mountain" - the iconic face-profile of New Hampshire, which used to be visible high on a crag on nearby Cannon Mountain. That crag crumbled away over 10 years agp, but the little paved spot (with interpretive sign) at the pullout is still here. I was about to keep walking past this point when I noticed that there was a faint herdpath leading up into the forest from behind the lookout area. It wasn't marked, but it was distinctly there. We were well past the point where I would have expected the Greenleaf Trailhead, and I was starting to resign myself to going all the way back down to the Bridle Path. But, this felt about right... so, I told the others to hold on and I sprinted up the faint path to check it out. 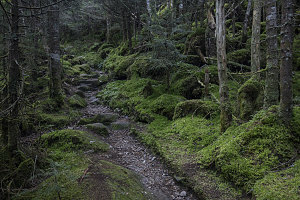 After following the path uphill through open forest for perhaps 50 yards, I came to a quite distinct path traversing along the forest slope. 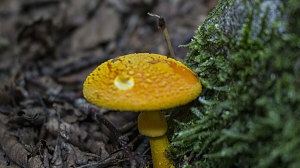 This had to be the Greenleaf Trail, I thought - what else could it be? I called to the others (who were still in earshot down at the pullout) to come up. I was quite curious about how I could have missed the trailhead - surely it must come out roughly in the area near where I parked, but where? I was looking for it and didn't spot it. 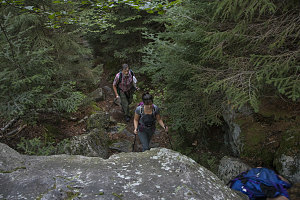 Anyhow, the important thing was that we were now (probably) on the Greenleaf trail, and ready to explore upwards, into new terrain (none of us had been on this trail before). The going was steep but the trail felt lightly-used, but despite that, in pretty good shape. About 35 minutes and about 800 feet of elevation later, we came to a spot where a big vertical cliff suddenly shot up on the left side of the trail. 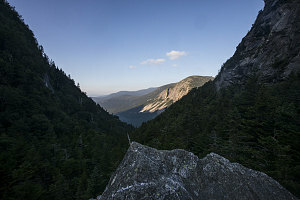 We had arrived at the eastern end of the Eagle Cliffs, where a notch separates it from the western flank of Mt Lafayette. 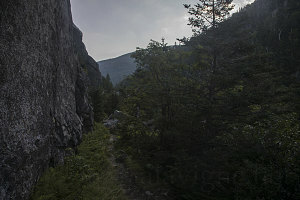 This notch is known as Eagle Pass. Eagle Pass is a pleasant little nook. 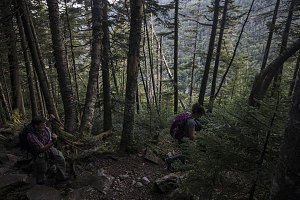 There's a nice big slant-sided boulder that you can walk to the top of, providing a great view back west through the pass and to the land just south of Franconia Notch. Cannon Mountain's big cliff is prominent. 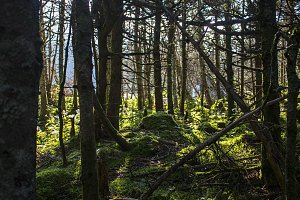 At Eagle Pass, the forest environs suddenly became very mossy. Quite beautiful and enchanting, it remained this way for most of the next section of trail - an easy but at-times-bouldery ascent up the lower western flanks of Lafayette itself. 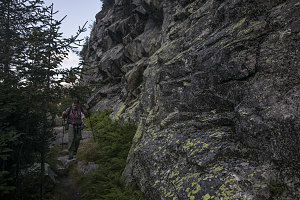 The Greenleaf Trail intersects with the Bridle Path trail at the Greenleaf Hut, which was now not far above us. 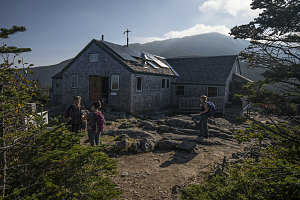 Our trail had been very quiet so far today, but now we started to see large groups of hikers coming down - likely the hut's overnight residents, now happily finished with the hut's breakfast and just now starting their way back down to the trailhead. 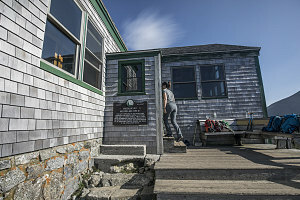 We arrived at the 4200-foot Greenleaf hut at about 8:40 a.m.. As I had mentioned before, most everyone had cleared out from the night before and breakfast was over. 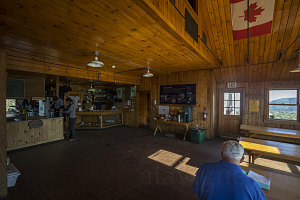 The staff were winding down from their morning duties, and the place was quiet. There were some self-pay delicacies available on a table in the hut... perfect for our mid-morning break!